This is a bright and colourful dish, the rice pilaf has lovely flavours and textures with the sweet raisins and crunchy cashews, matching nicely with the fresh snap of the green beans with aromatic toasted coconut. Serve as side dishes or make a meal out of it with a dahl stew, naan bread or samosas. In a medium-large pot, heat oil and add mustard seeds. When they begin to pop, stir in onion and carrot. Cook for a few minutes until the onions begin to get soft, then stir in ginger, cloves, bay leaves, turmeric, garam masala and salt. Combine well, then add rice, nuts and raisins. Add the water or broth (3 cups if using white rice, 4 cups if using brown) and stir well. Cover, bring to a boil, then simmer on low until cooked (20 minutes for white rice, 40 for brown). 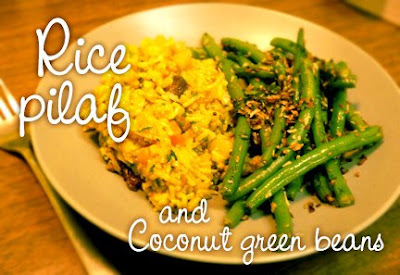 While rice is cooking, prepare Coconut Green Beans (recipe below). When done, stir in a tablespoon of ghee if you like, plus 3/4 of the cilantro, then serve garnished with remaining herbs. Serves 4. Steam the green beans until tender crisp (slightly under-cooked). In a wok or pan, heat oil with mustard seeds. When the seeds begin to pop, add semi-cooked green beans, sesame seeds and coconut. Stir fry for several minutes until beans are done and coconut is lightly toasted, then season with salt and fresh ground pepper. Just before serving, sprinkle with the lemon juice and cilantro. Serves 2.
elicous recipe..love beans with coconut..
You have a very nice blog. Looks very delicious. I tried this and it turned out very well and was delicious ! Instead of basmati rice, I used thai jasmine and used pine nuts instead of almonds. Just amazing, and have enough left over for tomorrows lunch. Perfect, thanks again Fran. I made this tonight for dinner, too--it is absolutely AMAZING! Thanks so much for sharing and for bringing so much love into my kitchen!